A great course, small numbers, good company and came home with lots of examples and inspiration. Thank-you. 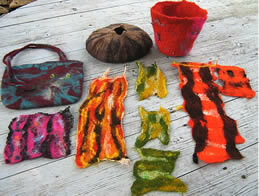 Nikola is an excellent teacher and textile artist. 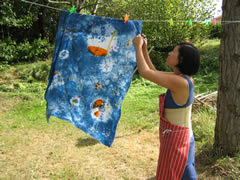 I had the pleasure of attending a tailor-made 3 day textile workshop in the summer, in her sunny, open-concept workshop. She was able to put together a program specific to my needs and time constraints. 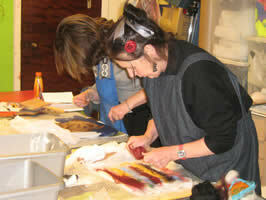 In 3 days we were able to cover batik, block printing, and shibori using indigo dyes. Nikki is someone who is very personable, passionate and talented. I learned a lot, was well taken care of, and we had tonnes of fun together. She is fantastic! For anyone who is into textiles, go take a vacation in Aquitaine and get your creativity flowing! Loved my shibori workshop at Texatelier -- superb instruction and enjoyable day, complete with delicious lunch and great company. Nikola's course was exceptionally well prepared and organised - having thought of all things in advance the course was well presented and differentiated to each individual's needs encouraging both risk taking and creativity.